Back in the 1960s the character of superspy James Bond was the big thing. Of course, that meant all sorts of variations and imitations came along to cash in. On TV there was The Man From UNCLE about a pair of agents (one American, the other Russian) who worked for an international law-enforcement agency (think United Nations). 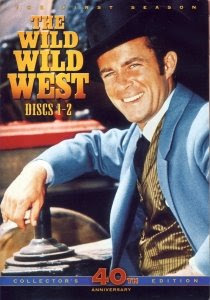 After the success of that program, the following year (1965) another superspy series debuted, The Wild Wild West. This one was conceived as James Bond in the days of cowboys and Indians, post Civil War. The hero was Jim West, top agent for the US Secret Service. Handsome and tough, he wore fancy cowboy duds that hid all sorts of clever devices –-smoke bomb, plastic explosive, tiny gun, etc. -- that would come in handy when trying to escape from the clutches of a supervillain. But when those devices didn’t work, he used another one: his macho charm to woo a villainess away from the influence of a criminal mastermind. -- Be seen stripped down to your waist. In every other episode Jim West would take advantage of a situation to expose his bare, semi-hairy torso. Or the supervillain he faced would be so stupid to tie him up half-naked so that his bod would sway any woman, thus making it easy to evade torture and prolonged imprisonment. -- Don’t waste time during the initial contact with a new babe. In less than three minutes propose an invitation to dinner or the theatre. Or both. But when you plan both, keep in mind your energy levels. Before the date you’ll have to beat up seven thugs or be beaten up by said thugs. Bare-knuckled fighting is intrinsic to he-manism. So don’t overextend yourself with a dinner-theatre combo date. -- If it’s female, kiss it. Of course, in every episode Jim West always met very attractive women: there was no problem for him to frequently lock lips. In real life your own mileage may vary. Also, remember that West always met healthy women. He was never depicted with cold sores. But besides these great scoring tips, try to remember this major point: the typical female viewer of The Wild Wild West would see Jim West and then expect a man in non-TV existence to be the same way. So if you want to be a success with a chick, play along with the illusion. That’s if you think such a woman is worth it. Think green. Care about the environment. The latest fad. Now take your Halloween pumpkin. Last fall when the holiday was over you could’ve tossed it in the trashcan. But why bother? Just dump it outside on your lawn. During the winter it will slowly rot and deflate. When the warm weather finally arrives, the sun will biodegrade what’s left. Of course, it looks like crap, but who cares? This is only Plattsburgh. And if visitors to the city feel green from looking at such stuff, so what? Vomit is also biodegradable. Ask any pub-crawler who didn’t properly regulate his intake during a night downtown. The downside: I waited for over a month for an appointment with a neurosurgeon. I called my doctor’s office (general practitioner) a couple of times, left messages, but no reply. The other day I found a message on my answering machine to call the medical center across the lake in Vermont for pre-registration. I assumed that this was for the neurosurgeon and that I had a few days before the appointment. Wrong. When I called to pre-register I found out I was supposed to be there the next day at 10 AM. I don’t have a car; I have to make arrangements for transportation. So I had to cancel the appointment. It had been made four weeks ago. There had been plenty of time for someone to contact me, especially after I had left two messages with my local doctor. From what I’ve gathered my doctor’s office screwed up; it was up to them to inform me about the appointment. The upside: the numbness remains in my left leg but it doesn’t last as along and I don’t have the weakness in my ankle that made it hard for be to stay steady while walking. What has helped so far is physical therapy in a swimming pool and exercises at home. Apparently numbness is more serious than just pain, indicating serious pressure on a nerve. If the therapy works, I can avoid surgery. The most ignored sign in downtown Plattsburgh. This was supposed to be a positive post. I was going to remark how Trinity Park looked so much better after all the organic litter had been raked up and hauled away. But when I walked through the park today, I noticed three fresh piles. So why bother calling it a “park?” A better name would be The Dog Dump. For some North Country residents it’s a dark trek from late fall to early spring. The warmer weather and longer days of springtime make the unhappy holiday memories of last December fade away. But isn’t Christmas a time of good cheer? Not for everyone. Take “Leon,” a victim each year of the blue Christmas syndrome. In the dead of winter with its long black nights and gray days, the holidays mean pain, not pleasure. SAD or Seasonal Affective Disorder accounts for part of the problem. Christmas is supposed to fight the wintry gloom but bright decorations and upbeat seasonal music has the opposite effect on Leon. As a child he thought Christmas never lived up to its hype. “Who are these people?” he stated in an email interview. “Didn’t they learn anything from last year? Daylight is disappearing day by day and it gets colder.” His depression starts at Thanksgiving and can end by mid-January. Leon experiences headaches and anger, loss of energy. He tired when he’s supposed to be energetic, ready to participate in the holiday activities. At first blue Christmas was easier to deal with when he was working. He could channel some of his anger by taking on extra work and burning energy. But this didn’t help because it made the problem worse: it increased his fatigue and stress; he became more inflexible in any negotiations. Leon was asked how others should respond to his state during the holidays. And what about all those newspaper and magazine articles that explain how to deal with seasonal stress and depression? Francesca Hartnett (center left) makes a point during the organizational meeting of the City of Plattsburgh Neighborhood Association. She was trying to get a handle on what the City of Plattsburgh Neighborhood Association was about. With an umbrella organization it can be difficult summing up the diverse activities under its auspices in a few words. Previous to this meeting a steering committee of concerned citizens had outlined the structure for the Neighborhood Association. Around 20 people gathered Tuesday evening in the City Hall conference room to learn more about the group and help organize it. Meeting coordinator Stuart Voss discussed the broad structure of the proposed association. There would be an executive committee that would work with representatives from four zones designated by the steering committee. Each rep would provide outreach in the neighborhoods in a zone, identifying key issues. But the NA as envisioned wouldn’t be locked into a strict hierarchy. Voss explained that it could work on both local and citywide levels at the same time. It was important to get feedback from citizens and have them network with each other. This somewhat loose structure could mean that neighborhoods with overlapping issues could work together and address those issues in their part of the city. General issues would mean all NA members would approach city officials en masse. During the meeting various problems were mentioned, from unleashed dogs to litter to rising taxes. It could be confusing for someone unfamiliar with an umbrella group. What was the focus? Or as one woman had asked, what was the cause? To elect representatives the attendees gathered into small groups broken down by zone. Then the groups re-met as one to announce their choices. I didn’t sit in with any group. I was there as an observer (albeit a semi-objective reporter). While I walked around the room to take a few photos, I had a good overview of the NA structure: localized and citywide at the same time. At this point the plan is for the NA only to have a couple of general meetings during the year. The concentration will be on outreach, recruiting new members, and overall promotion. Officers were elected. Two zone rep positions are still open. Nancy Monette was elected as president, Doug Butdorf as 1st vice-president, and Valerie Raugi as 2nd vice-president. As 1st VP Butdorf will be responsible for maintaining communications among the neighborhood representatives while 2nd VP Raugi will have the duty of identifying issues. For more information on the NA, call Nancy Monette at 561-8225 or email her at nmonette@charter.net . UPDATE (3/17/09): In the comments section accompanying this post I address the issue of “politico-babble.” Feel free to join the discussion. Recently it was reported in the news that the Plattsburgh Police Department used a “nonlethal” sponge round to subdue someone during an armed standoff. Sponge round? A term unfamiliar to me. Time for some Google research. A sponge round is a projectile four inches in length, 1.6 inches (40 millimeters) in diameter, with a large foam rubber nose. Images of this projectile can be found on the Web. At first glance a sponge round looks like a big toy bullet, maybe ammo for a Nerf gun. But it’s no toy. Fired from a grenade launcher, the projectile uses blunt impact to stun the target. 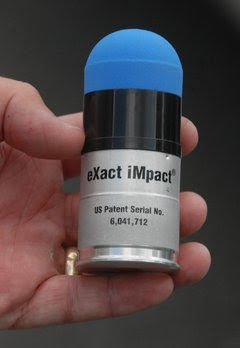 Another invention in the search for the perfect nonlethal weapon, from rubber bullets to pepper spray to Tasers. The preferred term is less-lethal weapon. While intended only to incapacitate the target, rubbers bullets and Tasers have proven to be deadly at times. The incident in Plattsburgh involved a distraught person armed with a knife. When dealing with someone with emotional problems, the police prefer to incapacitate with less-lethal weapons than use deadly force. Some argue that this can put an officer in danger. The less-lethal weapon might not be as effective as a gun. The target might be able to ward off the injury and then attack the officer. Last year in Oregon the police confronted a violent man wielding a hammer. The man was hit six times by sponge rounds and still had to be Tasered. At this time a Google search doesn’t reveal any reported fatalities associated with sponge rounds. 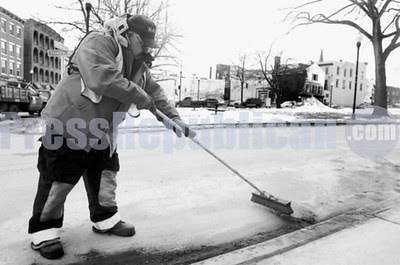 Terry Prentice, a laborer for the City of Plattsburgh, cleans the street near Trinity Park. As the snow recedes, all kinds of trash is [sic] suddenly uncovered, and the city's Public Works Department is working to get it cleared. Photography by Daniel Geldert. Sculptures by Charles Dilzer. North Country Cultural Center for the Arts, 30 Brinkerhoff Street, Plattsburgh, NY. Exhibit ends on March 21st. Call 518-563-1604 for details. Go green. That’s the big fad now. If the City of Plattsburgh wants to go green, it should eliminate the unwanted brown, i.e., dog*hit left behind by rude dog-owners. Take a look at Trinity Park since the snow melted: canine carpet-bombing. The Lake Champlain Weekly changed dog*hit to dog**it. OK, no problem there. It still gets the point across. Good editing. Bad editing. Bad grammar. Not mine. As you can see someone in the NYC area has been documenting the dogshit problem in his neighborhood with colorful indications. More details here. I’ll stick with photographic documentation and digital spraypainting. I remember when the new mall opened in the Town of Plattsburgh, there was a shuttle bus between the south and north complexes. This wasn’t a county-funded public bus but a private one run by the mall itself. Customers rode it instead of using their cars. Then one day a memo came down from the main office: There would be a reduction in the shuttle service. Reduction. How much?, I wondered. 20 percent? 50 percent? No, the “reduction” was 100 percent. That’s why you should always carefully read any official document. On January 28th the U.S. House of Representatives passed their version of the Economic Recovery Package. This included $50 million in supplemental grants funding for the NEA (National Endowment for the Arts). So let’s say you’re a busy senator – like Chuck Schumer – and you just read that part of the amendment. Sounds OK, doesn’t it? Getting rid of some pork. Why should a private, for-profit casino or golf course or stadium get special funding? I can understand why Chuck initially signed off on the amendment. Information overload. Museum? Theater? Art center? What do they have to do with casinos and their ilk? This amendment cut funding to nonprofit arts organizations, until there was the uproar by the arts community. It was revised to only exclude any casino or other gambling establishment, aquarium, zoo, golf course, or swimming pool. Sometimes I pause while reading, caught off guard by what is purported to be fact. When they came to Plattsburgh in 2006, their visit was a colossal flop. They elicited little if any reaction from the public, other than a peaceful, united "Stop Hate" campaign in opposition to their "God Hates Fags" diatribe. Huh? Little reaction from the public? Peaceful? The above image is one of many I took during the 2006 visit to Plattsburgh by the Fred Phelps Circus. As you can see, emotions were riding high on the anti-Fred side. You’ll find more like it at my archive site, www.writog.com. The Press-Republican also ran similar pictures taken by its photographers –- at least ones more family friendly. That’s the thing about being a reporter or photographer: you get out of the office and see what’s going on in the real world. The PR editor should leave his climate-controlled bubble and rub elbows with the hoi polloi more often. Or at least pay attention to the images from his photogs that cross his desk. One time a businessman vehemently voiced his frustration at a Common Council meeting. He was upset with the City of Plattsburgh and its haphazard way with downtown redevelopment. All the city did, he stated, was throw crap on the wall to see what would stick. There’s some truth to his criticism. Plattsburgh isn’t following a grand design or overall vision to meet the changes that have diminished downtown over decades. The biggest blow to downtown was the first mall that arrived in the Town of Plattsburgh, sucking away chains stores like Wards and JC Penney. Instead of concentrating on bringing in new retail businesses to draw back the customers, the city just widened the sidewalks, planted some trees, and made its main street, Margaret, one-way. Since then some of the trees have died, Margaret is again a two-way street, and sections of sidewalks have been torn up, notched out to restore a few parking spaces. This stuff didn’t stick to the wall. Studies like the Draft Report of the Plattsburgh Brownfield Opportunity Area zoom back and consider the big picture. You might not agree with all of the suggestions in the PBOA report but at least it offers a grand design to consider. The Draft Report addresses one of downtown’s major problems: an anchor to draw in people. Plattsburgh can dress up its downtown all it wants with fancy antique lights (that radiate garish yellow glare) but that’s just a cosmetic solution. Give people a destination; better yet, give them destinations. The Strand Theatre could indeed be a draw but there should be more. The Draft Report suggests a downtown grocery store. Fine, but what about a small department store? Even a dollar store would help. Why should I have to go to the mall via the bus to get a light bulb at a reasonable price when I should be able to walk downtown and pick up one? First, get the people coming in, generating revenue. Recruit new businesses, the right ones. Then redevelop your buildings and parks. Outside of a former mayor who wanted to bring in a Kripsy Kreme doughnut shop, I don’t hear anyone out there actively promoting downtown. If the City of Plattsburgh is so concerned with cosmetics, then it should concentrate on a particular concern mentioned in the Draft Report: the perception that downtown is dirty. And that perception, as regular readers of this blog know, is a valid one. Plattsburgh should maintain what it has. Keep it clean. That would be a lot cheaper than new paint jobs on buildings and other such spruce-ups that do nothing to bring back people.